This is an unofficial guide, but it worked for me, and I hope you find it useful. I think this is especially important if you work in a library which tends only to compare itself or benchmark against other organisations that are already very similar (such as academic libraries) and discussion with a mentor from a different information environment will help you generate new ideas about how to provide a better service for your users. Think about your development in the broadest possible sense. Don’t compare yourself with other people – this is your learning journey and what matters is that you have made progress from your starting point. Remember that training takes many forms: it can be on-the-job, shadowing, researching, learning by doing (i.e. there is no-one else I can find to teach me – I’m just going to have to figure it out as I go along) – it’s not just about attending a course. And if you do go on a course, take time to reflect on what you’ve learned and how you will put it into action. CILIP recommend that you attend a Chartership course. Before the day, do some research into what you need to do to submit your portfolio, and be ready with questions. You’ll get more out of the course if you arrive prepared and are already familiar with the basics. The people who will be speaking at the course know their stuff, so use the opportunity wisely by asking them things you can’t easily find out by reading about Chartership on the CILIP website. At the course, there may be portfolios on display. Take a look at these and make notes to help you remember the good (and bad) points that you want to remember to include (or avoid) in yours. It’s that simple – just write it. If you need help with eking out all 1,000 words, try Written? Kitten! which rewards you with a picture of a cute kitty (sorry, dog lovers) each time you write another 100 words. Gather certificates, emails, blog posts, tweets, policies… any documents which support what you have written in your evaluative statement about your development. Order, number and name them so you can easily cross-reference them from your statement (you are a Librarian, after all). When using documents which contain names, emails or similar personal information about other people, you need to think about how you will present this information in your portfolio. I had seen other portfolios in which candidates had obscured these details but I felt that this made the documents look censored. Instead, I asked permission from the people involved to reproduce these documents in full and all of them agreed. I made clear in my portfolio that these documents were included with permission, and I thought this looked more open and inviting to read. CILIP have started accepting electronic submissions and I would recommend this as it allows you to use working hyperlinks in your portfolio (I used these to link from my statement to the evidence and back again) and saves you having to print and bind three copies of your portfolio. This post is part of 23 Things for Professional Development. I think my involvement with professional organisations is more intermittent than continuous as I tend to be intensely involved when there is a conference or other type of event to focus on e.g. blogging about CILIP Umbrella conference 2011. I wonder if part of the reason is that I work in a generalist library which covers a wide range of subjects at undergraduate and taught postgraduate level. Most of my work involves management, and I develop those skills continuously and often blog about management. However, there is no other big issue or subject I have in common with other professionals. If I worked in a subject-specific library, I think I would feel more inclined to join a specialist group such as BLA or BIALL. For my current role, relationships within my institution and its broader organisation are the most important, and this is where I focus most of my efforts. I was a member of CILIP when I was at library school and I am a member again now, but I did let that lapse for a few years in between because I could not see the benefits clearly enough to justify the cost, especially on relatively low wages at the beginning of my career. Perhaps this comes back to a breath/specificity reason: CILIP tries to be so many things to so many different people that sometimes it’s hard to see exactly what it is for. Similarly with Chartership, which I am currently working towards: the skills you have to demonstrate are described in very broad terms, because Chartership candidates come from a wide range of sectors and job levels. I come from a background in teaching, where the National Curriculum and exam board specifications are quite precise and fact-based, and with Chartership and its focus on description and evaluation, I have found it difficult to know if I am meeting the required standard. In conclusion: although I am not very active in national professional organisations, I still believe it is important to share your knowledge with others and I do this via Twitter, blogging and by being an active member of local professional groups and committees. I’m involved in most of the online networks mentioned in the instructions for cpd23 Thing 6, with the exception of CILIP Communities. I’m quite tempted to extract a list of everyone I interact with on these sites and see which sets they fit into, but that might be a bit too geeky, even for me. Intimacy is also implied by language. In descending order of implied intimacy: Facebook ‘friends’, Twitter ‘followers’, LinkedIn ‘connections’. I update and/or check Facebook and Twitter daily, but LinkedIn maybe only once a week. My LinkedIn profile is there as a placeholder, rather than as a hotspot for interacting with other people, but I’ve connected Twitter and LinkedIn so that I can automatically push tweets with the hashtag ‘#in’ to my LinkedIn profile in order to update it every so often. I include slightly different information in my bios on each site, reflecting the parts of my life which are relevant to the people I’m connecting with in each. There is some social mobility in these worlds – you can follow someone on Twitter, at some point meet them in the real life and maybe one day promote them to being your friend on Facebook. The separation of these spheres allows me to update groups of people differently – I rarely use the same status update on Facebook and Twitter, for example. I’m on Google Plus but it hasn’t inspired me so far – I quite like the separate social networks that I already have, and I can’t yet see what G+ can do better. Still, it’s early days. Unfortunately CILIP Communities doesn’t work for me – I’ve grown so accustomed to RSS and social networking sites that any site which requires me to (a) go and visit it and then (b) doesn’t show me what’s new since I last logged in is not going to win me over. There’s a big difference between me being a member, and me actually participating in all of these. Sometimes it can be overwhelming to be part of all of these online networks, and perhaps it’s best to stick with the ones that work for you and concentrate your efforts into those. Alan Brine (De Montfort University Library) carried out a survey of library staff IT skills in order to target staff training needs. A number of competencies were listed, and each respondent ranked their ability by selecting one of these options to describe their skill level: I can / I need reminding / I can’t. As possibilities multiply and skillsets expand, who will keep current? Good IT skills are a common requirement for many library jobs nowadays, but it is not always easy to know what is meant by this or find a way to measure it at interview. Many library-related IT skills may be specific to a particular role depending on which integrated library system is used, whether staff support students who use Windows, Mac, Linux or other systems or a combination, so many staff will need on-the-job training once in post even if their general IT skills are already good. This audit and follow-up sounds like a great way to assess the gap between the skills required and the skills of the current team members. Nick Stopforth (Newcastle Libraries) gave a fast-paced tour of technology developments on the horizon and their applications and implications for libraries. He encouraged us to think of the opportunities and the gaps associated/filled/opened up by each. Nick works in the public library sector, and feels that academic libraries are ahead in terms of technological change and he gains a lot of useful ideas from following them – as an academic librarian, this felt good to hear! 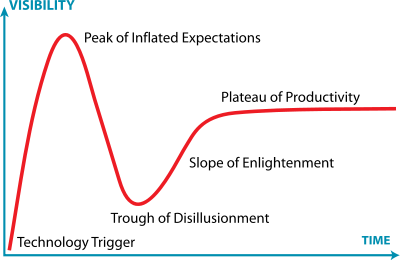 Hype cycle – bear this in mind when considering adopting a new technology. It can be difficult to tell where you are on the curve – he suggested that Twitter was at the ‘peak of inflated expectations’ but I think who you are and how you use a technology has a strong influence here. 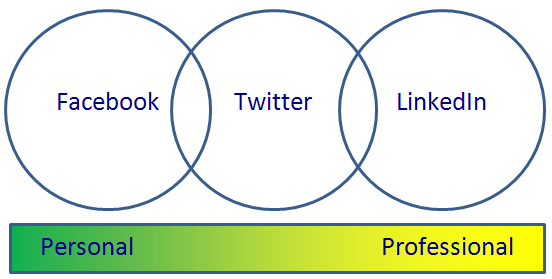 For example, for me and many other librarians who use Twitter, I feel that I have reached a point in my relationship with Twitter where it really helps me do my job and network with other professionals, and I would place our use closer to the ‘plateau of productivity’. Signposting – useful in libraries! 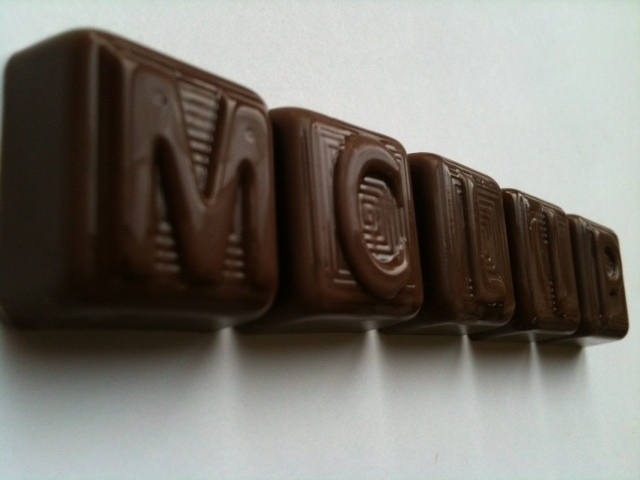 Linked data – where does it go? During a session about skills for equality, a discussion began about the ‘hierarchy of oppression’. I learned that this idea was current in the 1970s, and it held that of any list of persons who may be oppressed in society, they were not all equal in terms of the degree of oppression they experienced, and the moral status of their disadvantage (gay people, for example, could be perceived as having ‘brought it on themselves’, or could choose whether or not to reveal their identity, unlike a person of colour). Thus, one group’s needs or rights could be seen as ‘trumping’ those of another. Although it was felt that the concept of the hierarchy of oppression is now out of date, there have been cases reported recently in the press in which a person with a religious belief has refused service or otherwise discriminated against a gay person (here is one example as reported in The Guardian). Examples from the world of libraries included a library employee who refused to be involved in activities and displays helping to promote the services of a family planning centre because she was a Roman Catholic, and another library employee who would not direct library users to information resources for lesbian, gay and bisexual people because they were Muslim. I would like to point out, as did many people in the room, that having a religious faith does not necessary mean that you subscribe to a particular set of beliefs about contraception, abortion or sexual orientation, but that was the case in the examples given. Two ways of approaching such situations were presented: changing the employee’s duties to focus their work elsewhere (a bit of a cop out? ), or possible disciplinary action if the employee did not follow customer service guidelines and instruction from their manager about how they should do their job (a bit fierce and unlikely to change the person’s mind?). It makes me sad to think that some people think their individual beliefs can be used as an excuse to infringe the rights of others, and provide them with poor service. This discussion carried on long after the end of the official session, and I was cheered up by a woman who described herself as a Christian and did not see any justification for such prejudices in her chosen religion. I really enjoyed this session, led by Miggie Pickton (University of Northampton) and Carolynn Rankin (Leeds Metropolitan University). What does research look like? Everyday research skills include: reading, watching, questioning, summarising, presenting, listening, choosing, organising, writing up, reflecting. Many of us are already doing research, but maybe we just don’t realise that it is research! Library practitioners are often highly innovative in their practice and undertake research-related activity as a normal part of their working lives. This new knowledge and understanding is often not recognised as research nor is it shared with the wider professional community. How could this help my practice or benefit my organisation? What has been done on this before? Where is the evidence base? Where are the gaps? Who will you engage with and how? Where will your research make a different? Finally, the multiplier effect comes in when you add skills. This session was practical and energising, and it started me thinking about the many ways I could apply these ideas to my work.